Vegas Strip Blackjack grew in popularity on the Vegas Strip. Go figure. The game is played like traditional American Blackjack whereas your goal is to get as close to 21 without going over and beat the dealer. 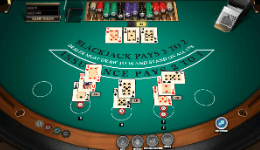 However, Vegas Strip Blackjack has some unique rules that make it different from other forms of the game. Below you can find the rules, odds and tips and also play some fun blackjack games to polish your skills. You can enjoy two versions of Vegas Strip which you can play here on our site. We hope to add more in the near future. 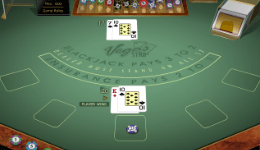 Vegas Strip Blackjack has some variants in rules that not only make it more fun to play, but also more advantageous to the player. Vegas Strip uses just 4 four decks. Many other games use up to 8. The lower number of decks used, the lower the house edge becomes. Obviously, this is just one of the benefits that come with Vegas strip Blackjack. Dealers always stands on a 17, whether it’s a soft or hard 17. This is another advantage of the game as well. NYX allow you to split only once, while in Microgaming are allowed to split up to 3 times, giving you a total of 4 hands to play on one deal. Aces may only be split once however. You can split any 10 value cards. Many forms of Blackjack only allow you to double on totals of 9 through 11. In Vegas Strip Blackjack, you can double down on any total of your first 2 cards. You may also double down on any total after splitting. Obviously, the main advantage is the use of just 4 decks. Other advantages include the dealer having to stand on any 17 as well as being able to double down on any 2 cards. Splitting up to 3 hands is yet another one of the pros for playing Vegas Strip. While there are many advantages, there are also a few minor disadvantages. Not being able to surrender, and no re-splitting of Aces does have it pitfalls. Having said that, the pros in this game far outweigh the cons. In fact, Vegas Strip blackjack has a very high player return of 99.65% (99.60% at the NYX version). This equates to a low house edge of only 0.35%. This is one of lowest house edge in any form of Blackjack. Many of the standard Blackjack strategies will apply. Always double on 11, always split Aces etc. Other strategies that are unique to this version would be doubling when the dealer shows a 6 and your total is less than 11. This lets you take advantage of the many times the dealer will bust in this situation. Btw, if you check the NYX game, you can follow the perfect strategy by choosing the Auto strategy mode. Bottom line: It’s a super fun Blackjack variant to play and should be on the top of your list when deciding which form to play. Although its name is derived from a physical place, Vegas Strip Blackjack can be played online in some Microgaming and NYX casinos. We would recommend Jackpot City, but you can just take a look at our updated rating of best blackjack casinos.